Baking cakes from scratch is not usually a process I embrace, and I’m not ashamed to admit that I’ve baked some pretty tasty cakes by “doctoring” a Duncan Hines mix. So why did I decide to give this recipe a try? Pinterest (where I spend waaay too much time). I saw it there and, since my mom is a chocoholic…and it was for her birthday…I reached for the flour and the cocoa and followed the super-easy directions. 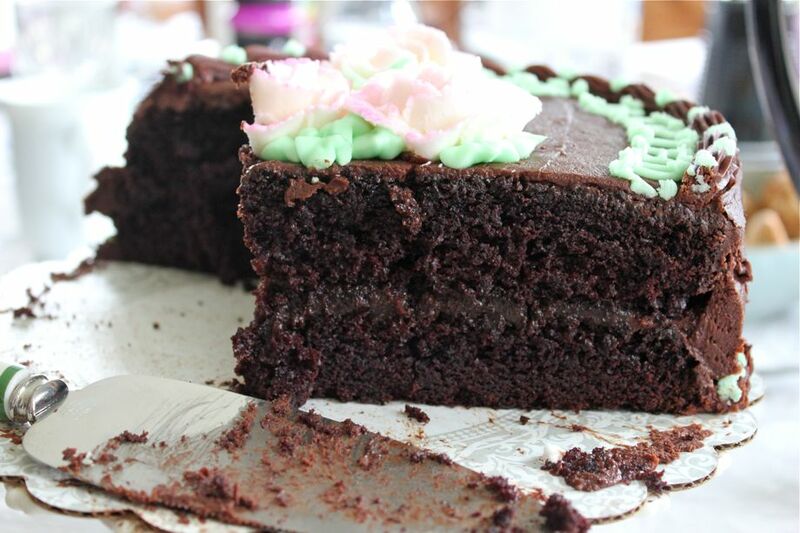 The recipe is HERSHEY’S “PERFECTLY CHOCOLATE” Chocolate Cake and it is soooooooo chocolatey and moist. After all the ingredients are mixed (in a single bowl) you add 1 cup of boiling water, which makes the batter really really thin (like REALLY thin). No worries, though, because it magically bakes into two super delicious layers of chocolate cake goodness. The “PERFECTLY CHOCOLATE” Chocolate Frosting is, yes, perfect, and super easy. Since I filled the cake with Chocolate Bavarian Cream, the two-cup yield was just enough to frost the two 9-inch layers. I think what I loved best about this recipe is that it’s made with basic ingredients and requires minimal preparation. And though I have no plans to give up my Duncan Hines habit, it’s good to know that I can bake a decadent chocolate cake without a mix…and I know you can too!! It was very moist and delicious!